FCFS came up on one of our screens this week. They operate a large number of pawn shops (488) and short term loan stores (124) in The US and Mexico. The economy is not going to turn around for individuals any time soon, so it would be reasonable to make a bullish call on the pawn and payday loan industry. Prior resistance was at the 40 level which has turned into support since then with a few dips below on bad market days. FCFS is also resting on trend line support from February 2010. The 50 SMA is currently around 45 and the 200 SMA is around 40. The 200 SMA is trending up so 40 seems like a reasonable support point. There are several ways of approaching this trade. An equity limit buy at the trend line with a stop below the trend line for a tight stop, Setting a wider stop below 40 might also be viable, but that’s a $3 loss from where we are right now. Another angle would be to enter this trade using options. 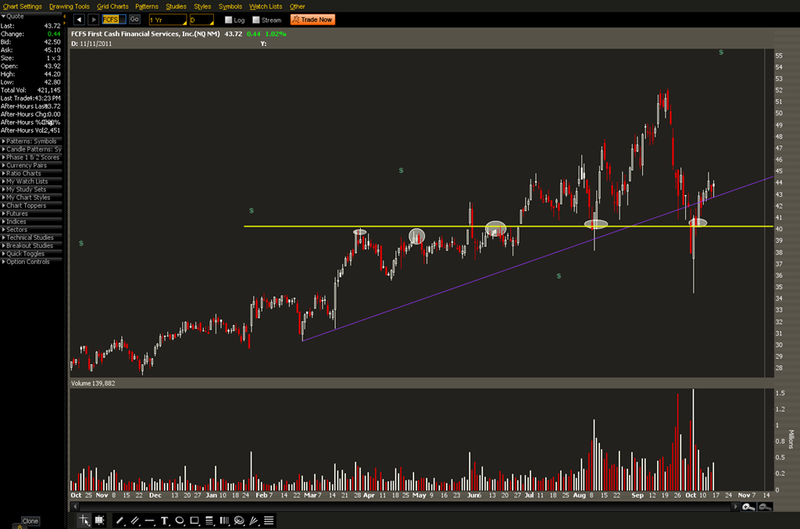 For this trade we would sell the October 40 PUT at the MID for .45 Then buy the November 35 PUT for .50. This is done for a net debit of .05. The maximum loss is $500 per contract. In this strategy we are looking to get assigned the stock at 40. Essentially we’ve put in a limit order to buy at 40 and are collecting .45 for placing that order. The November 35 PUT acts as a hedge in case the stock has a large decline. At expiration of the October 40 PUT we can roll them into a November 40 Put to create a Bull Put Spread. The MID is worth about 1.35 credit. After accounting for the debit of .05, the net credit is 1.30 If the stock does drop below the short put by options expiration we get to keep the 1.30 credit. 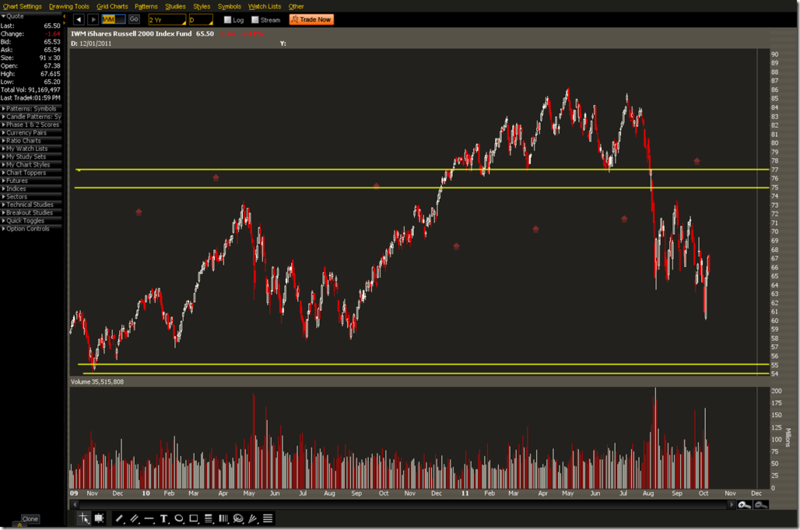 The widest stop should be around the 36 level if this is approached as a short term trade. A longer term option would be to accept assignment and sell the long put for an extrinsic/intrinsic value. This approach gives defined risk and allows for multiple exit strategies. As always a good trader should pick the best strategy and stay with it. The market has been a little crazy lately and unless you’re scalping intraday it’s hard to find something that works well. What we’re testing out here is a very wide unbalanced Iron Condor on IWM. Below is a two year chart showing how wide this spread is. 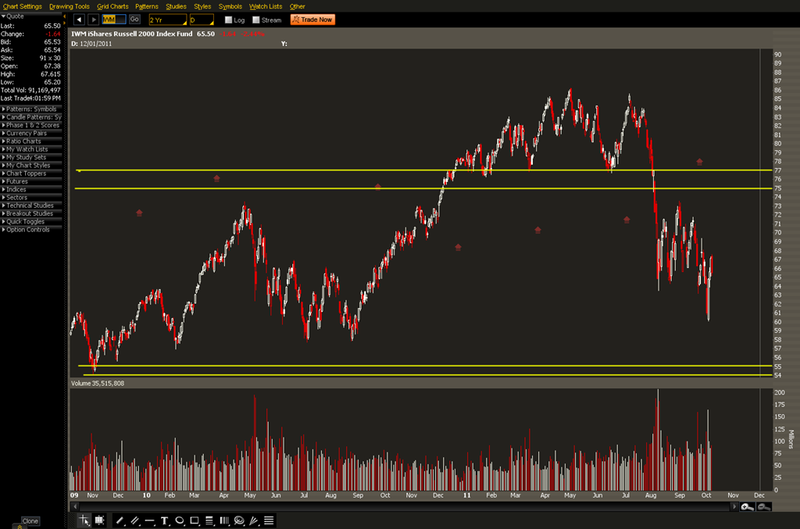 The lows were from November 2009 and there are several support levels that we must go through to reach our loss point. To the upside there is resistance at multiple levels starting in August with a recent head and shoulders pattern and multiple points in 2010. There’s a lot to go through before it reaches either side of the condor. The Trade is to sell the 75/77 Call and the 55/54 Put. At this point we’re more worried about downside risk than upside, so the the downside is 1 strike wide with a max loss of 55 per contract. The upside is 2 strikes wide with a max loss of 155 per contract. This is something that depends mainly on Theta (time decay) so direction isn’t that important. If things start to move above the H&S to the upside some equity or call positions in TNA could be used to hedge. 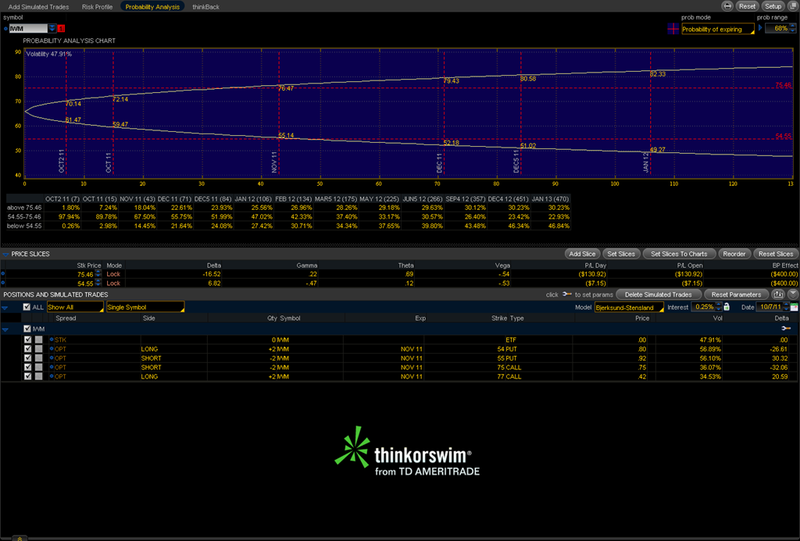 For the downside long equity or call positions in TZA can be a hedge. 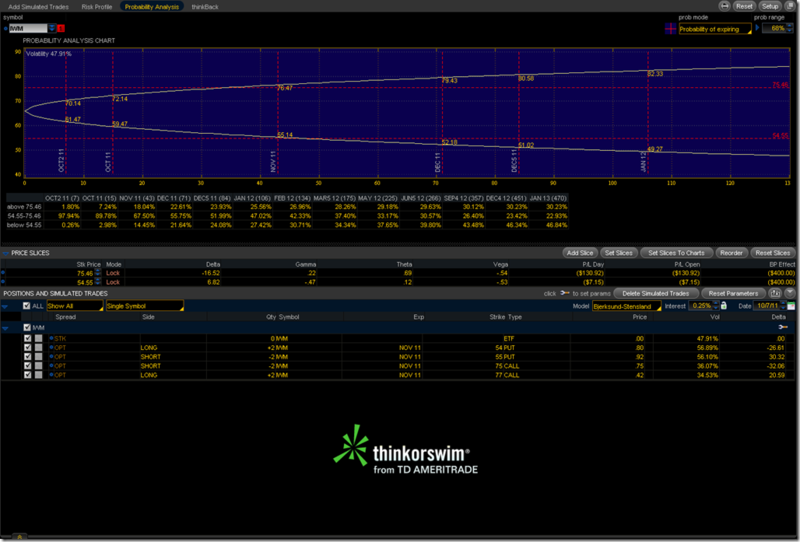 Based on things as they stand today this trade has a 70% chance of expiring between the two strikes. This is a relatively low risk position and offers opportunities to hedge risk to cover the max loss should the stock move that far.